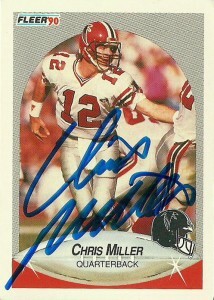 I got Chris’ autograph way back in 1993 at the CGA Youth Golf Tournament when he was a member of the Atlanta Falcons. 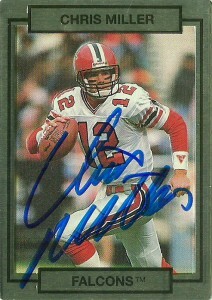 I noticed that he was now on the staff of the Arizona Cardinals as their quarterbacks coach, and wanted to add him to my collection on a few more cards. 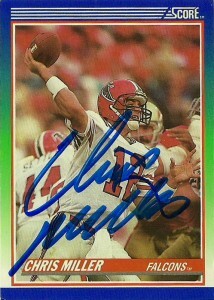 After I had recent success with former Falcons runningback John Settle, I decided to give Miller another shot after all these years, where he graciously signed all 4 of these cards for me in 26 days. Really pleased with these 4 cards. They actually represent a good sampling of my favorite cards to collect during that time period, with Fleer, ProSet, Action Packed, and Score. 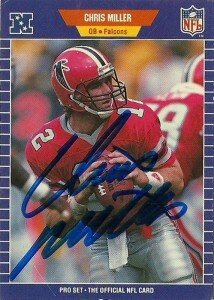 I loved this classic 80s look of the Falcons, and miss this rich red color that they used back then. All of these cards had excellent action shots of Chris, with the Action Packed and Score cards really standing out with their dynamic poses. Design wise as you can see, near the end of the 80s nearly all the brands were framing all of their players in around all sides with a border. Fleer would become one of the first brands to ‘break the border’ as you can see with Chris’ helmet on his Fleer 1990 card.